Those days are gone when the workplace had a strict working culture especially for the dressing code. But now the golden era welcomes the flexible attitude toward the dressing style; say goodbye to the combination of black suit, tie and shirt, let us welcome the trendy set up. With the new flexibility, we can now dress up according to our taste and style. But still we need to keep some combinations in mind before going for your work; for style tips read out guide. Style Tip 1: Always remember to match belt with shoes especially when it comes to conservative dress like corporate places or offices. Wearing black is the safe option but if you are going for brown then make sure the belt matches with your shoes. Style Tip 2: If you love wearing tie then make sure you tie it properly; also keep in mind the length of your tie too. Once you are an expert to tie the knot, the next thing is how long your tie is. Well, the rule says that your tie must touch your belt line. Moreover, thinner men look good in thinner ties while larger men look good in wider ties. Style Tip 3: Wearing dress shirts can be impressive too; Style with a pair of nice fitted jeans, with a tie and for an add on you can even go for a leather strap watch. Style Tip 4: For a semi-formal day, you can wear your chinos with a crisp white shirt, tie and a blazer. We cannot forget shoes so it would be moccasins. And if you are short in height, don’t worry you can look fashionable and trendy with height increasing shoes. Style Tip 5: For casual Fridays; wear your jeans with sneakers. This is the best for your fun Friday and chilling out with your mates. Style Tip 6: Wearing sweater is fine but playing with patterns is quite risky especially for your office. You can go for cardigans if not sweater. Style Tip 7: If you are crazy about wearing T-shirts then try pairing them with your denim. But please no cartoon type t-shirts. Unless and until you are not working in some animation company or you are not going for a fancy competition. 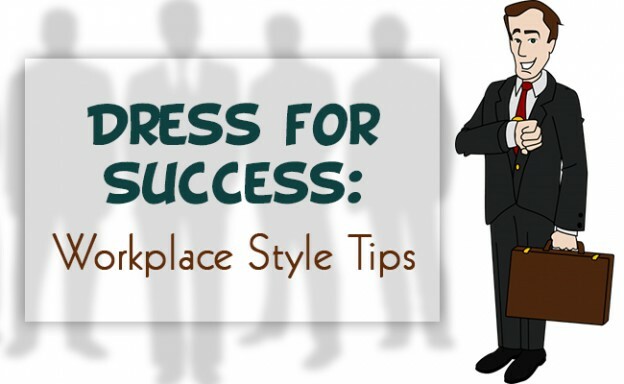 On That Note: Follow these style tips and we are sure you'll rock your style even in your workplace.